(ărəbĕsk`) [Fr.,=Arabian], in art, term applied to any complex, linear decoration based on flowing lines. In Islamic art it was often exploited to cover entire surfaces. The arabesque in modern usage derives from a Renaissance design which was Greco-Roman in inspiration. Generic term for an intricate and subtle ornate surface decoration based on a mixture of intermixed geometrical patterns and natural botanical forms used in Muslim countries. 1. Intricate overall pattern of geometric forms or stylized plants used in Muslim countries. 2. 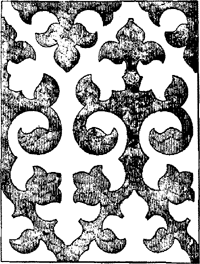 Overall decorative pattern of acanthus scrolls, swags, candelabrum shafts, animal or human forms, on panels or pilasters, in Roman and Renaissance architecture. 3. A species of ornament of infinite variety used for enriching flat surfaces or moldings, either painted, inlaid, or carved in low relief. A An entire hall is devoted to his work in the Museum of Modern Arabic Art in Qatar, and luckily for us, unt? But, one might ask: what about Arabic art or African art -- why don't "we" ("Westerners") see the works of Arabic or African artists on auction sales, in exhibitions, art fairs? When did civilian deaths become normalized? Referring to the placement of the Torah, Bible and Quran next to one another she continued: "This gesture sends a great message from the UAE to people worldwide because many would expect a Middle Eastern museum to be focused on Islamic or Arabic art yet we find works from countries all over the world. Designed by London-based Interstate Associates, the trophies incorporate several elements of Arabic art and culture- the traditional architectural fret work and proportions of Middle Eastern ceramics. Startalk Arabic Camp - 2013 This past week I had the pleasure of once again teaching Arabic art to the Seattle Public School Startalk 7 Camp that was held from June 20, 2013 -- July 3, 2013. The design of the Louvre Museum structure will embrace traditional Arabic art as an Arabic souq-themed museum city is protected by a 7,000 tonne dome with a diameter of 180 metres, laced with layers of steel to create a so-called aACAyrain of light' shedding over the museum and its visitors. The collection that I am exhibiting in Oman is linked with the Arabic art of calligraphy, which is part of the Arab culture. Hewar Art Gallery, who has been the driving force behind bringing the artist to Dubai, strives to make a valuable contribution towards developing and facilitating greater appreciation of Arabic art and culture. It was the first time that Arabic art was presented on a large scale as part of the mainstream arts scene in Canada. Stating that Switzerland has played a positive role in promotion of other countries cultures, Maryam Al Zadjali said, Eoe1/4Eothe exhibition will help expose Arabic art to connoisseurs in the West. But I don't see enough attention paid to Arabic art such as calligraphy or even poetry.